The wild mustangs aren't the only residents of this remote area. There are quite a few beachfront homes, as well as homes back off the beach, where people live year-round. The largest community here is Carova, nestled next to the Virginia state line. 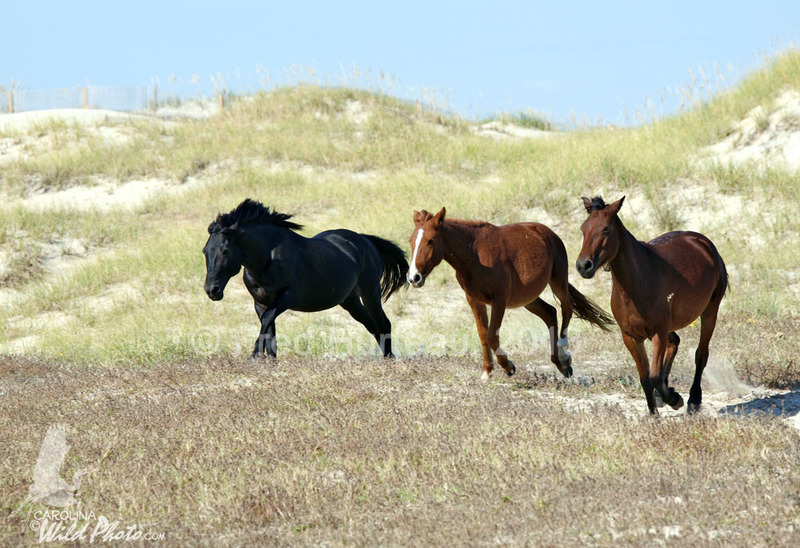 Beyond here there is no beach traffic, as the north horse fence not only keeps the Corolla wild horses from wandering into Virginia, but keeps people and vehicles out of the nature reserve on the Virginia side, where special permits are required. The wild horses and people live here side by side. Though the horses are accustomed to the presence of people and cars, they are certainly not tame. It is their wildness that protects them, for any of the horses that come to expect food or the attentions of people have to be removed from the wild herd. On such occasions the horses are taken elsewhere and put up for adoption, which then denies the herd of yet another member of an already endangered gene pool. For these wild Spanish mustangs to survive, there must be enough horses in the herd to maintain a viable bloodline for future generations. Everytime one of these rare horses is injured or otherwise has to be removed because of someone's careless actions, it puts the future of these magnificent mustangs in further jeopardy. There are ordinances requiring people to keep at least 50 feet away from the horses. No petting, feeding or harrassing of the horses is permitted, and enticing a wild horse to come closer than 50 feet to anyone holds the same penalty as getting too close to the wild horse yourself. 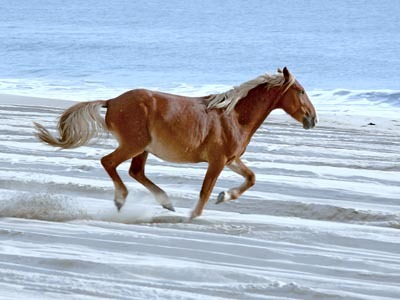 There is also a speed limit on the beach, not only to protect the horses, but beachgoers as well. There are patrols driving up and down the beach to watch for infractions. 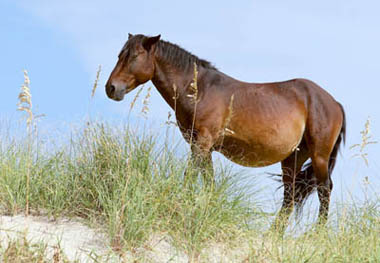 Visitors must keep these things in mind when they come to see these wonderful wild mustangs.